Father pulled out several banknotes as 15-year-old Litea Cavalevu ate her breakfast of oatmeal and bread. The new school year had just begun for Litea in Fiji. Tuition was free at her Seventh-day Adventist school, just as it was at all schools in Fiji, but students needed to make a special payment for field trips and other expenses. Students who didn’t pay the fee could still go to school, but they would miss out on the fun of going on field trips to World War II monuments and to the historic sites where missionaries first arrived in Fiji. “I’ll give you the receipt after school,” she promised. When she arrived at school, she immediately went to Teacher and held out the money. Teacher looked in a book. Litea was surprised, and she sat down at her desk. Teacher looked at the book again and began to call out the names of students who had not paid their fees. One of those students was Litea’s friend, Ilisavani. Litea knew that Ilisavani’s family didn’t have much money. Ilisavani’s father was working in Australia, picking oranges as a seasonal farm laborer. But he wasn’t earning much money to send home to Fiji. Ilisavani’s mother was struggling to feed her and her three brothers and sisters. Litea walked over to Ilisavani. Ilisavani looked surprised. “No, I can’t take your money,” she said. Litea pressed the money into her hand. Ilisavani, with tears of gratitude in her eyes, accepted it and gave it to Teacher. Teacher filled out a receipt, which Ilisavani tried to give to Litea. 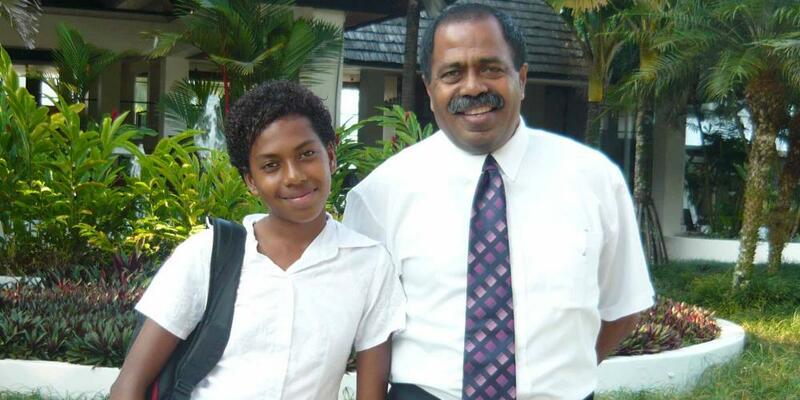 Father, who worked at the church’s headquarters in Fiji, wasn’t at home when Litea returned from school. He forgot all about the money and the receipt until the family was eating a supper of taro, cassava, and soup. Litea looked uncomfortable when he asked for the receipt. At that moment, Father remembered that his workplace had taken the money for the fees from his salary and sent it directly to the school. He had forgotten about that. “What happened to the money that I gave you?” he asked. Litea told how she had given the money to her needy friend. Litea squirmed in her seat. She didn’t want her parents to be unhappy. Then Father and Mother looked at each other and smiled. They realized that Litea was putting into practice a Bible verse that she had learned in Sabbath School. The verse, Matthew 22:39, says, “You shall love your neighbor as yourself” (NKJV). Litea heaved a sigh of relief. “Thank you for understanding,” she said. The next day, Ilisavani’s mother called Litea’s mother on the phone. She was crying. Father, whose full name is Save Cavalevu, is glad that Sabbath School taught Litea how to love others, and he hopes that many more children will learn the same lesson at his Narere Seventh-day Adventist Church. Thank you for your Sabbath School mission offerings that help build children’s Sabbath School classrooms in Fiji and other countries in the South Pacific Division. Getting a Best Friend Out of Bed on Sabbath Thirteen-year-old Dwight felt bad because his friend was missing Sabbath School and Pathfinders. August 18 - The Butterfly Church Ubake’s charming and colorful artwork helps to make the Adventist church in the Maolin valley stand out. However, it’s not the metal, wooden, or cloth ornaments that make this church known in the community.